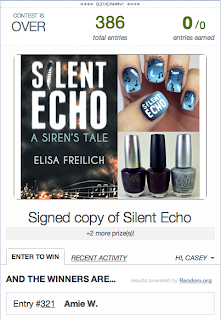 Saving the World One Nail at a Time: Silent Echo Giveaway! A few weeks ago I created a design to celebrate the book release of Silent Echo by author Elisa Freilich. In collaboration, we have brought you a chance to win some amazing prizes! The giveaway is international. Anyone in the world could win! Entering is easy, simply enter your email into the rafflecopter widget. The sole reason for your email will be to contact you if you win and this information will not be used for anything else. That's it! There are two ways to earn extra entries by sharing the contest on twitter and commenting on any of the Silent Echo blog posts, both are optional! The prizes will be a signed copy of Silent Echo, a false press on set of Silent Echo inspired nails hand painted by me, OPI DS Classic, OPI Midnight in Moscow and OPI DS Coronation. Remember, OPI DS colors are infused with diamond dust and typically priced higher than regular OPI shades. Plus, this prize pack is pretty priceless since you're getting a signed copy of book by the author! What are you waiting for?! Enter in the widget below. Update: the contest is now closed! The winner of the giveaway is Amie W! Stay tuned for the next giveaway when my blog hits 100,000 views. Right now we're up to 96,967!